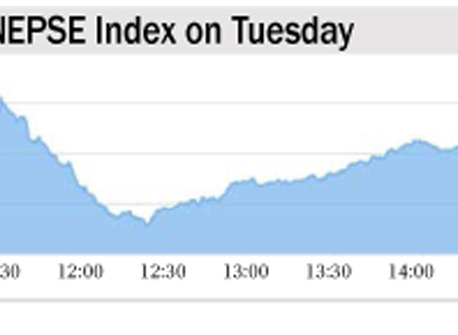 KATHMANDU, July 1: Nepal Stock Exchange (Nepse) index fell 3.91 points to close at 1,563.81 points on Thursday -- the last trading day of the week. The market remained opened for three days this week as Monday was a public holiday to celebrate Eid-ul-Fitr, while brokerage firms did not process purchase and sell order on Thursday to protest the direction of the Inland Revenue Department (IRD) to register for Value Added Tax (VAT). Market observers say that the high bank interest rates have been sending stocks down in recent months. As bank and financial institutions (BFIs) have been raising interest rates in the wake of shortage of lendable fund, the investors, who were relying on margin type loans to buy stocks, are either offloading stocks or not buying shares. Similarly, those with low risk appetite are putting their savings into fixed deposits which offer as high as 13 percent interest rates. “There is credit crunch in the banking system. Even the cash that could have come to the secondary market is now going toward rights issue,” Gunanidhi Bhusal, managing director of Aryatara Investment and Securities Company Ltd - a brokerage firm - told Republica. Many listed companies, particularly BFIs and insurance companies who are in a pressure to raise their minimum paid-up capital, are floating their rights issue. “The fund is now getting scattered in other sectors,” Bhusal added. A total of 3.41 million units of shares of 160 companies were traded in the market this week through 16,006 transactions. 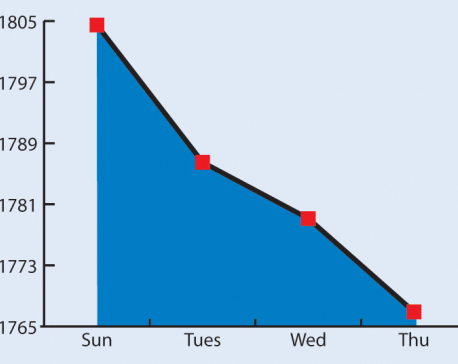 The turnover is 37.36 points lower compared to last week. Hydropower group led the losing side with its sub-index falling by 17.28 points to end at 1,946.88 points. Banking, the heavyweight group, also ended 7 points lower at 1,396.94 points. The Manufacturing and Processing, and Finance sub-index also shed 5.04 points and 4.75 points, respectively, to end the week at 2,379.4 points and 746.91 points. 'Others' group also lost 1.74 points to finish at 687.18 points. Insurance, Hotels, and Development groups, however, logged gains this week. While the sub-indices of Insurance and Hotels groups went up by 16.33 points and 24.74 point, respectively, to settle at 8,196.62 points and 2,242.4 points, the Development Bank sub-index ended 5.59 points higher at 1,927.74 points. 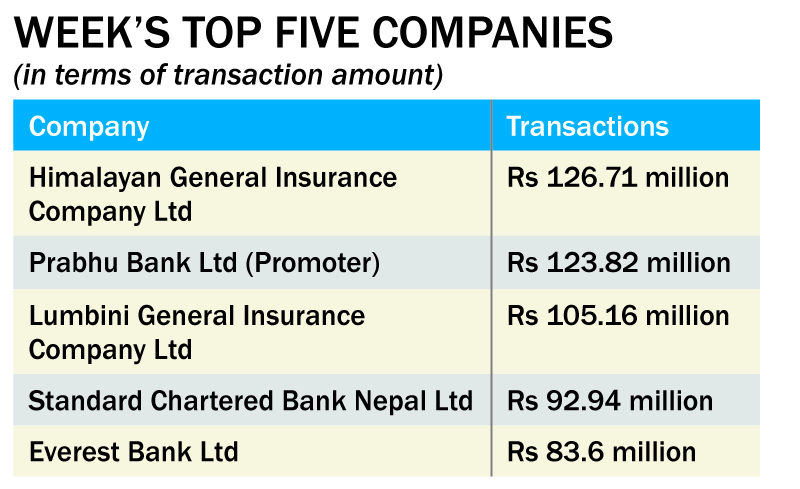 Himalayan General Insurance Company Ltd topped the list of companies in terms of highest turnover (Rs 126.71 million) and number of transactions (915), while Prabhu Bank Ltd was at the top in terms of number of shares traded (652,000 units).